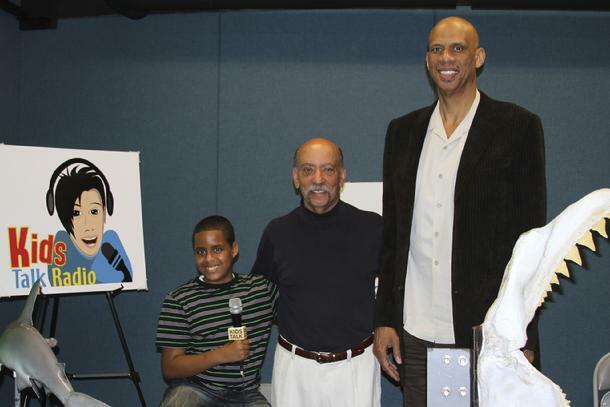 Kids Talk Radio conducted two interviews to inform students around the world about Kareem Abdul-Jabbar and the wonderful things he is doing as an author of children's books and as a Cultural Ambassador to the United States of America. 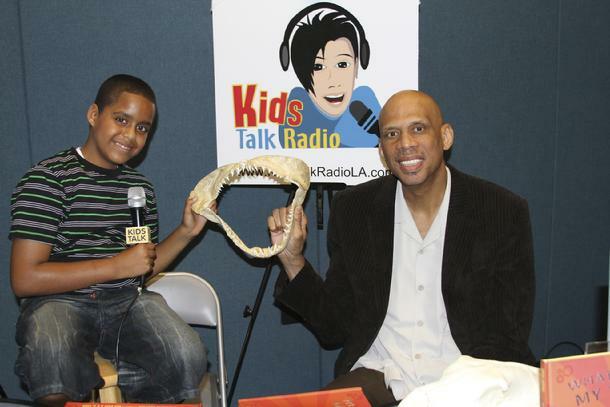 We invite you to listen to our interviews by Kids Talk Radio backpack journalist's Stone Houston (Age 10) and Bob Barboza, founder of Kids Talk Radio. Our interviews take place at our studio at the Aquarium of the Pacific in Long Beach, California. The main purposes of the interviews are to help our audiences to get to know Kareem Abdul-Jabbar the basketball player and youth author. 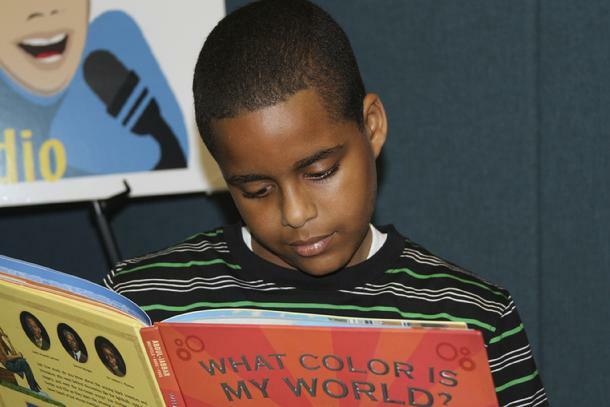 His latest book "What color is my world?" in an important work and should be in every school. 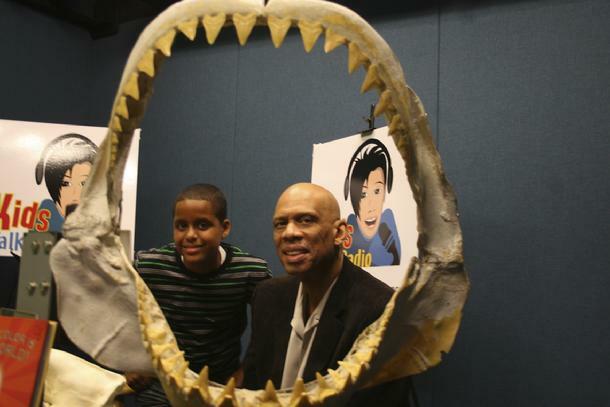 In addition, Kareem Abdul-Jabbar will be our featured author at the Orange County Department of Education and the 11 th Annual Young Author'' Faire. This is a free event, and Kids Talk Radio will have a booth with some of our new robots and our Kids Talk Radio Sound Effects Orchestra Workshop will be in a classroom. Students read stories and we place sound effects to support the stories. After the event the Kids Talk Radio will go on a recruiting tour of the Southern California SAM Ash Music Super Stores. Stop by our Young Authors' Faire Booth if you want to talk auditioning for Kids Talk Radio. Kareem Abdual-Jabbar will be on stage and all featured authors will receive a FREE pancake breakfast along with Kareem Abdul-Jabbar's book: What Color is My World?, generously provided by Wells Fargo Bank. 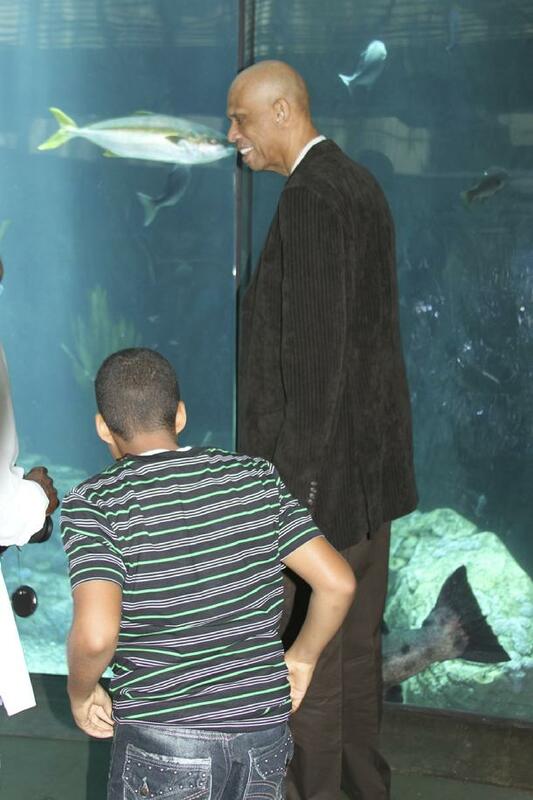 It was so much fun walking around the Aquarium of the Pacific with Kareem Abdual-Jabbar. He is a fantastic teacher and I learned so much listening to him talk about science. We went behind the scenes and got up close and personal with amazing animals. We all wanted to stay with Kareem all day. Everyone was nervous working with such a big super star, but we all did our jobs and Kareem helped us. 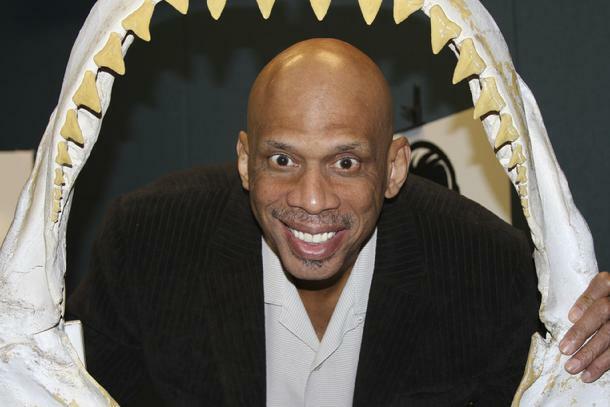 We had to work as a team to get this Kareem Abdual-Jabbar story out to the world. Our goal was to give people more information about this wonderful person. Kareem is our featured author at the Orange County Department of Education 11th Annual Young Authors' Fair. We hope that these interviews will help to inspire you to come out and see Kareem Abdual-Jabbar in person. The editors are working on the video portions of this interview and you will find them on our Kids Talk Radio YouTube. This is our Super School Teen TV channel for Kids Talk Visual Radio. Kids Talk Radio's News Anchor Andy Steadman will be available to sign autographs at the Orange County Department of Education 11th Annual Young Authors' Faire. Andy will be hosting the "Kids Talk Radio Open Mike Stage." In addition, Andy will be reading selected reading passages as a part of the Kids Talk Radio Sound Effects Lab Orchestra in building D room 1009. You are invited to see how we use technology to create sound effects for radio, television, computer games, educational training materials and Kids Talk Radio commercials. You have a chance to be selected to be on Kids Talk Radio with Andy Steadman and Stone Houston. 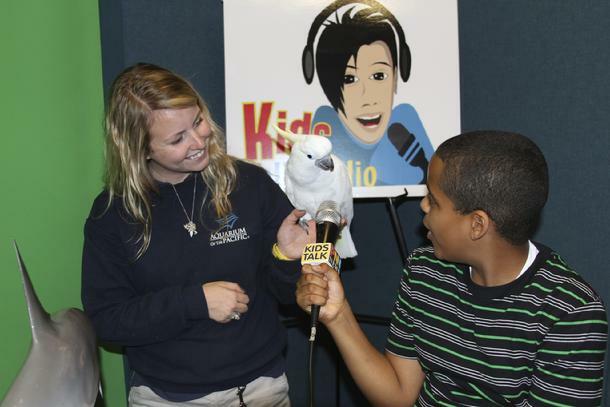 Kids Talk Radio Science will be reporting on the Cabo Verde Tenth Island Project. This project includes student backpack journalists, backpack scientists, and backpack robotics teams. 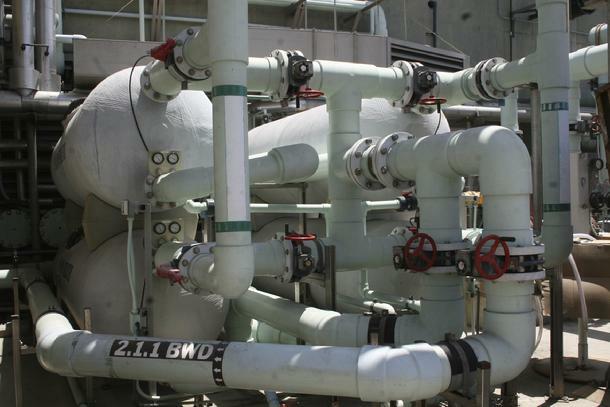 Our international STEM project will use Catalina Island, California and the uninhabited island of Santa Luzia Cape Verde. Participating teachers and students will represent USC Engineering, California State University Engineering, the University of Cape Verde, selected LAUSD science teachers and students, Kids Talk Radio backpack scientists and journalists from 50 US states and 34 collaborating countries. Students will be conducting experiments using science backpacks and they will have opportunities to use humanoid robots from France.